Following a competition run in partnership with Suffolk County Council, the Royal Institute of British Architects (RIBA) Competitions is pleased to announce that Foster + Partners has been selected as the architectural team to join the Upper Orwell Crossings project in Ipswich. The judging panel, chaired by Sir Michael Hopkins CBE, selected Foster + Partners from a strong shortlist of five internationally renowned teams that also included (in alphabetical order of design firm lead): Adamson Associates with William Matthews Associates and Ney & Partners; Knight Architects; Marc Mimram; and Wilkinson Eyre with FHECOR and EADON Consulting. 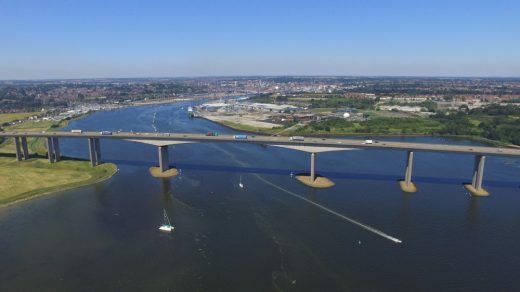 The Royal Institute of British Architects (RIBA) Competitions is pleased to announce the shortlist on behalf of Suffolk County Council for the Upper Orwell Crossings Project in Ipswich. The Pre-Qualification phase attracted a high quality range of submissions from practices of varying size based in the UK and internationally. The Evaluation Panel consisted of Suffolk County Council’s Project Manager and Planning Consents Manager, together with Kevin Drain (WSP | Parsons Brinckerhoff, Associate Director and Engineering Lead for the Upper Orwell Crossings Project) and Jonathan McDowell (Director, Matter Architecture Ltd.) acting as the RIBA Architect Adviser. 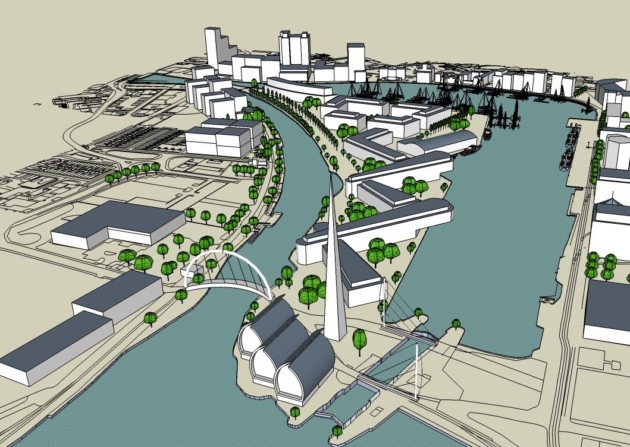 In selecting the shortlist, the Evaluation Panel looked for architectural teams who demonstrated experience of collaborating on major infrastructure projects, working within a multi-disciplinary team environment, and designing projects of architectural distinction with a complexity, scale and/or budget similar to that required on the Upper Orwell Crossings scheme. The appointed architectural team will join an existing project team led by WSP | Parsons Brinckerhoff who will be responsible for providing structural and civil engineering input to the project. The five short-listed teams will be invited to present their design concepts to the Judging Panel (Chaired by Sir Michael Hopkins CBE) in mid-December 2016 with the winner scheduled to be announced in early 2017. 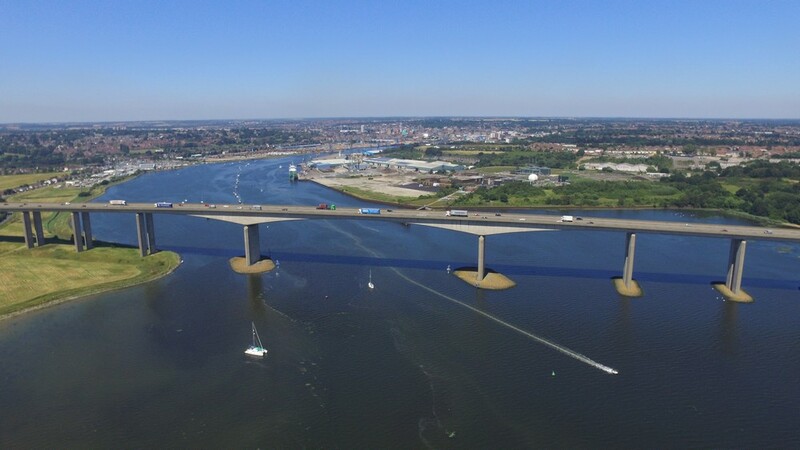 2nd August 2016 – The Royal Institute of British Architects’ (RIBA) Competitions unit is pleased to announce the launch of a design competition with associated tender process on behalf of Suffolk County Council for the Orwell Crossings Project in Ipswich. Commitment to fund this £77 million project was announced in the Chancellor of the Exchequer’s March 2016 Budget and will see the proposed construction of two new crossings near the town’s waterfront area, together with the refurbishment of an existing swing bridge across the lock which provides access to the ‘Wet Dock’ and its marina facilities. This major infrastructure project will ease traffic congestion in Ipswich by providing a major new crossing of the River Orwell, connecting the waterfront area to the town centre and improving journey times for vehicles, cyclists and pedestrians. It will also deliver a range of economic benefits and act as a catalyst and focal point for further regeneration, contributing to the continued prosperity, redevelopment and expansion of the wider waterfront area. 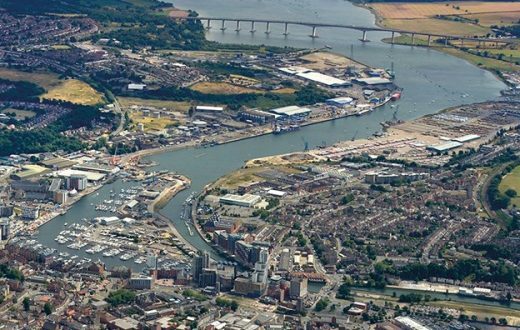 The development potential of the man-made peninsular Island which separates the Wet Dock from the New-Cut will also be released, joining the Island to the River Orwell’s west bank. The Council is seeking to appoint an Architectural team with experience of collaborating on major infrastructure projects, of working within a multi-disciplinary team environment, and the design of high quality bridge structures to programme and budget. The appointed Architectural team will join an existing project team led by WSP | Parsons Brinckerhoff (WSP|PB) who will be responsible for providing structural and civil engineering input to the project. It is envisaged that the project will also seek to utilise Early Contractor Involvement to aid development of the design concepts with respect to buildability etc. Responses to PQQs will be used to select a shortlist of candidates (minimum 5) to participate in the design concept phase of the competition. 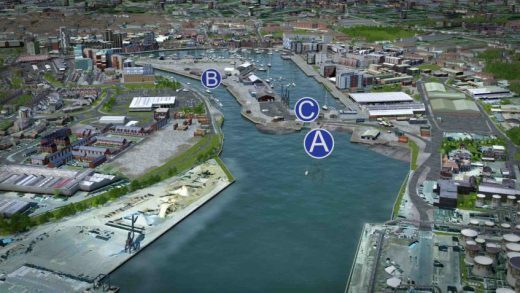 The scope of the competition will require short-listed Architectural teams to develop design concepts for the crossings independently of the SCC and WSP|PB design team. In addition to a registered practicing architect, Architectural teams may therefore wish to consider engagement of other specialist bridge consultant(s) within their team, which might include a structural engineer, M&E consultant and/or landscape designer to advise on the development of their concept proposals. Each short-listed Architectural team who submits a compliant tender for the competition phase and gives a clarification interview presentation will receive an honorarium payment of £10,000 (+VAT). It is the intention that the successful Architectural team will be appointed by Suffolk County Council to work alongside the team led by WSP | Parsons Brinkerhoff to develop the design proposals up to RIBA Stage 3 in the first instance. Progression of the project will be subject to securing necessary consents and confirmation of funding commitment. It is intended that the project will be delivered under a Design & Build contract and that the design team will be novated to the contractor. It is currently anticipated that construction will need to commence on site by 2020 in order to meet funding conditions for the Upper Orwell Crossings project. The deadline for submission of completed PQQ returns via the Suffolk Sourcing e-Tendering system is 17.00hrs (BST) on Thursday 01 September 2016.